The Canon PowerShot premium digital compact camera is an update to the PowerShot S95, but is it worth your cash? 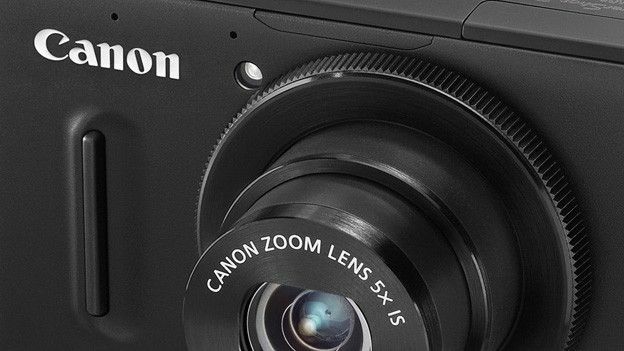 The new Canon PowerShot S100 could well be your new premium compact of choice if you want a portable back up camera for a digital SLR but don't want the doorstop-like bulk of the Canon PowerShot G12. Super slim, it does battle with the likes of the Panasonic Lumix DMC-LX5 and Leica D-Lux 5, while adding a GPS antenna, but costs as much as an entry level DSLR at £439. That's despite the small-ish sensor and the fact that the lens on the front cannot be swapped. Like the aforementioned rivals, Canon's upgrade features a degree of control placed around the lens, in the case of the S100 an unobtrusive control ring encircles the lens barrel. Enticingly tactile, this control can be spun this way and that to alter the likes of aperture (how much light the camera lets in), shutter speed (how long light is let in for), and ISO sensitivity, settings for which appear via a virtual lens ring at the bottom of the LCD display. A dedicated ring function button let the photographer specify which function the lens ring controls at any one time, with manual focus, white balance, zoom, contrast and aspect ratio (the dimensions of the eventual shot) also being up for grabs in this manner. Aside from this nifty feature that will appeal to those who want more than just a point and shoot, the Canon's controls are familiar and straightforward. You get a nine-option shooting mode dial up top with full compliment of manual and auto settings, next to a raised shutter release surrounded by a lever for zoom adjustment. Top right of the camera back and falling under the thumb is a video record button, with larger four-way control pad encircled by an operational scroll wheel just below. This allows menu settings to either be tabbed through in baby steps, or rushed through with a quick spin of said wheel. Menu and playback buttons complete the control layout at the back. While there's no obvious GPS control, this is activated or deactivated by drilling down into the camera's set up menu, so for those wanting to conserve battery life there's the option to leave it off. In the expected absence of any optical viewfinder, pictures and Full HD 1920x1080 pixels video are composed and reviewed via the 3-inch, LCD screen, presented in standard 4:3 aspect ratio. This offers a crystal clear resolution of 461k dots, and in practice avoids flare and ghosting whether utilised indoors or out. Screen display options include the ability to call up a nine zone compositional grid to practice your Rule of Thirds (placing your subject in the frame at a point that is most pleasing to the human eye). Plus, if you have program or one of the other more creative shooting modes selected, a live histogram showing the areas of brightness in an image can also be summoned up. This affords a degree of control over exposure. While the rugged feel and roughened non-slip surfaces of the Canon PowerShot S100 impress by subconsciously suggesting a pro digital SLR squeezed into a compact, pocket-sized form, one disappointment here is battery life. The Canon can manage just a paltry 200 shots from a full charge of its NB—5L rechargeable lithium ion battery pack. That's a day or a weekend's shooting at best, so you'll need to pack the charger if heading off on holiday for a week. Offering one touch Full HD video capture with the bonus of stereo sound, the Canon PowerShot S100 would seem to offer the full package for those looking for a capable all in one. It even features a wind reduction filter to avoid sounding like the user is trapped in a wind tunnel every time you hit record outdoors. We were also pleased that the full extent of the camera's 5x optical zoom can be utilised for video as well as stills, its focal range equivalent to 24-120mm in 35mm film terms. However in terms of quickly framing that shot, the transition of the zoom is much slower in video mode than in general operation. This is undoubtedly to minimise the low mechanical buzz of its motors being picked up on the audio track. Select video on the top plate shooting mode dial, and via a side panel there is the choice of shooting slow motion video at either 240 frames per second or 120fps, with the caveat being that resolution drops quite dramatically to 320x240 pixels or 640x480 pixels respectively. Unusually for a camera of this size you get the choice of JPEG or Raw stills shooting, plus up to 9.5 fps capture for action shooting. Of course you don't have to bother with any of this and the camera can purely be used as a point and shoot if twisting its dial to Smart Auto setting – a reliable helping hand when wanted to keep our attention focused on the subject not camera settings. Pictures are sharp for the most part with colours erring on the side of natural. The bright maximum f/2.0 aperture lens comes into its own in allowing some lovely shallow depth of field effects, keeping the subject sharp in focus but blurring the foreground and background. Even if we did notice some converging verticals or barrel distortion at maximum wideangle setting, this is common with most fixed lenses on pocket point and shoots that start out wider than most. In terms of low light photography, though, top-whack ISO6400 setting reveals softening of detail and blotchy grain, both are subtle at best; overall then a good picture performance across a range of conditions. The Canon PowerShot S100 is a pocket camera that packs an impressively comprehensive array of full manual and auto functionality into its slim 26.7mm depth. And, impressively this doesn't seem to have adversely affected image quality as the Canon is a consistent performer across a range of conditions. With its Achilles' heel the so-so-200 shot battery life, the real selling point here is the funky lens control ring, to which key functions can be attributed via a top-of-screen toolbar. Add in 1920x1080 video clips with stereo sound, integral GPS for location tagging of images, pop up flash and the ability to shoot standard JPEG or unprocessed Raw for top quality pictures and the Canon PowerShot S100 is a veritable pocket rocket for those who like the feel and functionality of bridge cameras and DSLRs, but hate the bulk.